A couple of months before I moved to Hawaii, I had the pleasure of meeting Chelsea Gossett. We met through my last job and it was during one of our conversations about shoes and fashion that she revealed she was a jewelry designer. Upon my moving, she asked me to help her with her business and I’ve been working with her since. 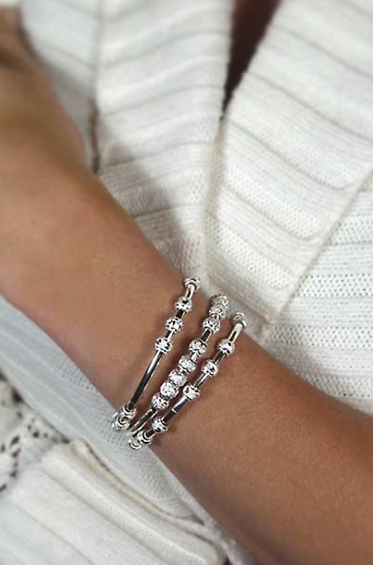 Chelsea designs Count Me Healthy bracelets: they are sterling silver bracelets with movable beads. Why movable beads? Because Chelsea realized she more frequently reached her health and nutrition goals if she had a way to track her progress. And instead of using a cumbersome notebook, why not use a stylish bracelet? So she created these bracelets. And they really are cute. There are a bunch of different types: the Original, Happy & Blessed, Golf Goddess, Bride to Be, and My Bridesmaids are just a few. Each type has a different moveable bead depending on the theme. One of the newer styles is Helping Hearts — with 25% of each bracelet sold goes to the WomenHeart organization. So while I love the idea of a wearable tracking tool, I also really love how this bracelet looks–particularly when worn stacked. I usually wear 2-3 at a time and it really looks great. In fact, Count Me Healthy offers Sassy Stacks which comes with three bracelets–instant stackability! The bracelets cost $88 each and are available online at countmehealthyjewelry.com and at select boutiques around the US. And stay tuned – Chelsea has some new styles hitting stores soon! i love my CMH bracelet! i have counted glasses of water, work outs per week, and cocktails per happy hour. fantastic idea and looks great with anything!